For me sailing on Karaka is not a temporary thing, it is a lifestyle. It is not a hobby, it is not a holiday, it is not a business, it is not a sport. It is all that at once and something else as well. My whole life runs around the ship, it is home, investment, bank, transportation, workshop, local pub, classroom, sport club; the base for everything that I do. On Karaka, all the aspects of my life are concentrated in the ship. It is good because living on Karaka is what I do. I don’t have times that are wasted doing something I don’t want to do in order to be able to do what I want to do later on. I don’t have to work 9 to 5 in order to have enough money to have a house, the house is paying for itself. I don’t have to find time off work for a hobby, my house and my job are my hobby. I don’t need to take 3 week off work to go on vacation, what I would chose to do on my vacation is what I do everyday. When people ask me what I do with my life, I tell them I’m living on a boat. That’s what I do. I am not racing around the world, I am not running a charter business, I am not on a sabbatical, taking a few years off from “real” life. I lead a self sustainable life on my ship. 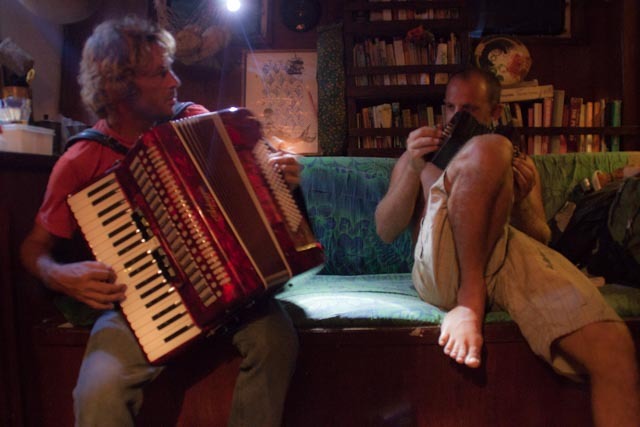 It involves sailing around the world, having crew members, visiting the nicest places I can find, smuggling whatever I can to make some cash, doing illegal charters, working on maintenance, playing accordion, diving, fishing and surfing, partying and basically having the best time possible. At the same time, the crew member who come only for one of the aspects of the life on board is going to be disappointed because he won’t find what he came for. The crew who joins is going to have to participate in the lifestyle, the whole of it. I don’t expect the crew member to adopt this lifestyle necessarily, although a few ex crew members have now their own boat, but I expect the crew member to come wanting to experience the lifestyle. 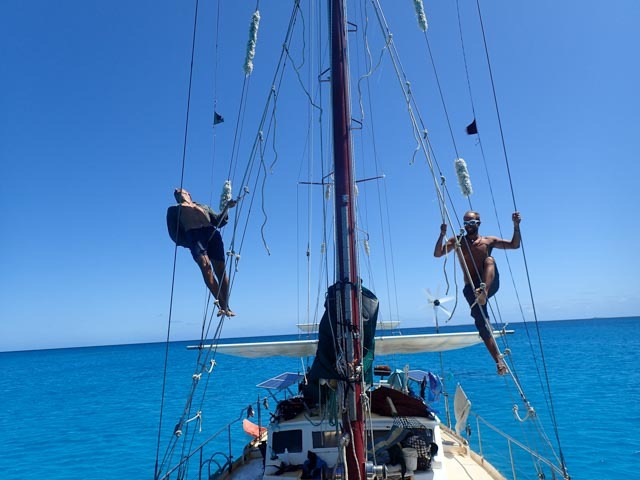 A crew member can’t join solely for the sport of sailing, or for a trip in a country he is interested in, or to live in a community with alternative views, or because he got a few weeks off work and wants to relax. 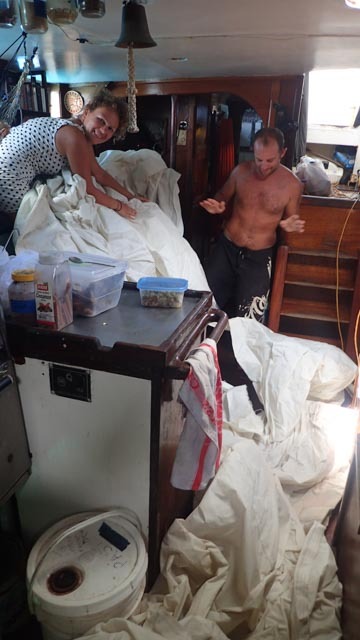 The life on board is inescapable for all crew members. Those who make the mistake to think they can have only one aspect of it usually don’t last long and decide to leave after a week. That is one of the reason why I prefer people who can stay for a minimum of one or two months and the longer the better. A shorter period doesn’t leave enough time to get involved and those who can’t take the time to get involved will miss the point. Karaka is not a sport boat. Although it is important to be fit as it can get strenuous, sailing on Karaka is mellow. During a crossing, I would say that only 10 percent of the time is spent doing something related to sailing, if that. The rest of the time the boat goes by itself. That is a lot of idle time in a close environment that rolls around and is crammed with other people. Restless people expecting a lot of activity will be disappointed by ocean sailing. It is most of the time a relaxing, mellow activity with short bursts of hectic action now and then. One should come prepared to occupy himself, reading, meditating, cooking, chatting, fishing, doing art, etc etc. Another thing I want to mention is about me teaching sailing to the crew. I do, to the extent that I can, teach sailing to those who come on board, although Karaka is not a sail training vessel. I am not a qualified sailing instructor and won’t deliver any certificate. One thing that I need to say is that I think that learning by heart how Karaka (or any other boat) works, is near useless. It might help you while you are on Karaka but it won’t really make you a well rounded sailor. So although I enjoy answering questions and explaining things to those who actively try to learn, mainly I don’t spend much energy on teaching to people how to do things. I prefer to teach the attitude of figuring out how to do things. That way, people end up understanding what they are doing instead of being automatons at my orders and more importantly, they gain confidence and the certitude that if they forget a specific knowledge, they will be able to figure it out again when needed. The amount of knowledge necessary to run a sailboat is staggering and few can claim to remember it all after a few months or even a few years sailing. After a while, with experience, things become natural, but for the beginner, the most important thing is to be able to correctly figure out what needs to be done and how it needs to be done. Sailing on Karaka definitely helps with that. I don’t like to teach what to think, I prefer to teach how to think. While coastal cruising, the sailing periods are shorter so the bursts of hectic action are closer to each other. 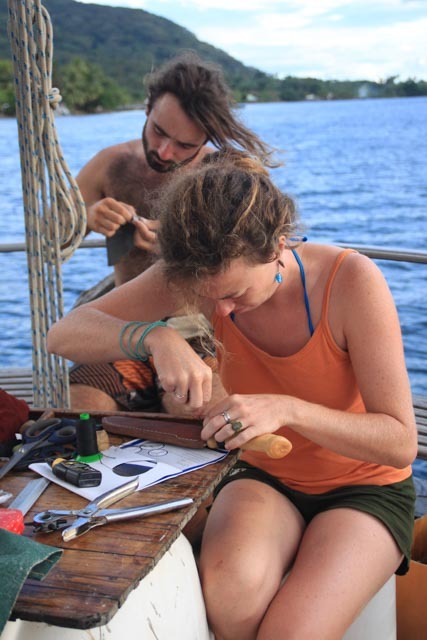 There is the possibility to get off the boat as well, so finding something to do is a lot easier. Yet, life afloat is slow. Life in the tropics is slow too. Life afloat in the tropics is particularly slow. There is just no need to rush. Life on Karaka is mostly good fun, but there are times where nothing happens, because it is raining outside or because it is sunday and everything is closed in town and the point break is flat. There are times when work needs to be done. There are times when we have to stay on the boat because it is too rough to anchor close to a landing spot. There are times when we are in sewer water near a ferry terminal in front of a polluted city and you can’t leave until some engine spare arrives by the mail. There are times when it is not so exciting, and people here for constant intense excitement won’t necessarily find it. Yet, a boat is like many things in life, you get out of it what you bring yourself to it. When times are slow, the one who can’t entertain himself will get bored. It would be his fault.